By using Vardhaman Bank Mobile Banking service, the Customer thereby agrees to these terms and conditions, which form the contract between the Customer and Bank. Mobile banking service of the Bank shall be governed by such terms and conditions as amended by the Bank from time to time. These terms and conditions shall be in addition to other terms and conditions relating to any account of the Customer and/or the respective product or the service provided by the Bank unless otherwise specifically stated. The Mobile Banking Service will be available to customers having a satisfactory running Savings/ Current/ Over Draft account with the Bank. Accounts where mode of operation if ‘Joint’ as also accounts in the name of Minor below the age of 15 years or where minor is a joint account holder are not eligible for Vardhaman Mobile. The per transaction upper ceiling per customer shall be Rs.50,000/- for fund transfer. Entering wrong mPIN thrice will block the Mobile banking service. Customer has to approach the Bank for unblocking the mobile banking app. Any change in the business rules of any of the mobile banking processes will be notified on Bank’s website www.vardhamanbank.com, which will be construed as sufficient notice to the customer. Bank reserves the right to reject a Customer’s application for Mobile banking service without assigning any reasons. Customer can request for termination of the service by giving a written request to the branch. The customer shall remain accountable for all the transactions on the accounts linked to the service made prior to confirmation of any such cancellation request. It shall be the Bank’s endeavor to give a reasonable notice for withdrawal or termination of the service, but the Bank may, at its discretion, withdraw temporarily or terminate the service, either wholly or partially, anytime without giving prior notice to the Customer. The service may be suspended for any maintenance or repair work for any breakdown in the Hardware/ Software or any emergency or security reasons without prior notice and bank shall not be responsible if such an action has to be taken for reasons of security or emergency. The Bank may also terminate or suspend the services under the Mobile banking without prior notice if the Customer has violated the terms and conditions laid down by the Bank or on the death of the Customer when the same will be brought to the notice of the Bank or when prohibited by law or an order by a court or Authority. Agrees to use the Vardhaman Bank Mobile service for financial and non-financial transactions offered by the Bank from time to time. Authorizes the Bank to map the account numbers, Customer ID and mobile phone number for the smooth operation of Vardhaman Bank Mobile service offered by the Bank and to preserve the mapping record in its own server or server of any third party and to use such data at its discretion for providing/enhancing further banking/ technology products that it may offer. Irrevocably authorizes the Bank to debit the Account which have been enabled for Vardhaman Bank Mobile service for all transactions/services undertaken using mPIN. Agrees that he/she is aware and accepts that service offered by the Bank will enable him/her to transact using mPINwithin the limit prescribed by the Bank and the transaction being bonafide will not be disputed. Agrees that transactions originated using the mobile phone are non retractable as these are instantaneous/real time. Agrees to use the service on a mobile phone properly and validly registered in his/her name only with the Mobile Service Provider and undertakes to use the service only through mobile number which has been given to register for the service. Agrees that the Bank is authenticating the Customer by his mobile phone number and mPIN provided by the Customer and that such authentication would be sufficient for protection of the customer transactions. The customer is solely responsible for maintenance of the secrecy and confidentiality of the mPIN without any liability to the Bank. The Bank at its discretion may adopt other authentication of electronic records and the same will be acceptable and binding on the customer. Customer shall be required to acquaint himself/herself with the process for using the service and that he/she shall be responsible for any error made while using the service. The instructions of the Customer shall be effected only after authentication under his/her application password and mPIN or through any other mode of verification as may be stipulated at the discretion of the Bank. Bank reserves the right to decide what services may be offered. Additions/deletions to the services offered under the service are at its sole discretion. While it shall be the endeavor of the Bank to carry out the instructions received from the Customers promptly, it shall not be responsible for the delay/failure in carrying out the instructions due to any reasons whatsoever including failure of operational system or due to any requirement of Law. The Customer expressly authorizes the Bank to access his/her account information required for offering the services under the service and also to share the information regarding his/her accounts with the service provider/ third party as may be required to provide the services under the application. Customer hereby authorizes the Bank or its agents to send promotional messages including the products of the Bank, greetings or any other messages the Bank may consider from time to time. Customer understands that the Bank may send rejection or cannot process the request messages for the service request(s) sent by the Customer which could not be executed for any reason. Bank shall make all reasonable efforts to ensure that the customer information is kept confidential but shall not be responsible for any inadvertent divulgence or leakage of Customer information for reasons beyond its control or by action of any third party. Customer expressly authorizes the Bank to carry out all requests/ transactions purporting to have been received from his/ her mobile phone and authenticated with his/her mPIN. All payment transactions, initiated from the customer’s mobile phone using his/her mPIN, will be treated bonafide expressly authorizing the Bank to make the payment. It is the responsibility of the Customer to advise the Bank of any change in his mobile number or loss/ theft of mobile phone by adopting the procedure laid down by the Bank for the purpose. Telecom Service provider of the customer may levy charges for each SMS / GPRS and the Bank is not liable for any dispute that may arise between telecom service provider and the Customer. 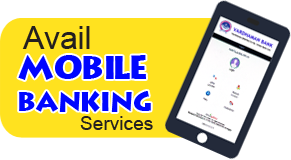 At present, Bank does not charge any fee for offering this Mobile Banking service. Bank reserves the right to charge the Customer fee for the use of the services provided under the service and change the fee structure at its discretion. Display of such charges on Bank’s website would serve as sufficient notice and the same is binding on the customer. It is the responsibility of the Customer to provide correct information to the Bank through the use of the service or any other method. In case of any discrepancy in information, the Customer understands that the Bank will not be in any way responsible for action taken based on the information. Bank will endeavor to correct the error promptly wherever possible on a best effort basis, if the customer reports such error in information. Customer accepts that the Bank shall not be responsible for any errors which may occur in spite of the steps taken by the Bank to ensure the accuracy of the information and shall not have any claim against the Bank in the event of any loss/damage suffered as a consequence of an inaccurate information provided by the Bank. Customer understands that the Bank will try, to the best of its ability and effort to provide accurate information and shall not hold the Bank responsible for any errors or omissions that may occur due to reasons beyond the control of the Bank. The Customer will be responsible for all transactions, including fraudulent/erroneous transactions made through the use of his/ her mobile phone, SIM card and mPIN, regardless of whether such transactions are in fact entered into or authorized by him/her or not and the customer will be responsible for the loss/damage, if any suffered. The Customer shall take all possible steps to ensure that his/her mobile phone is not shared with anyone and shall take immediate action to de-register from Vardhaman Bank Mobile service as per procedure laid down in case of misuse/theft/loss of the mobile phone or SIM card. The Customer shall keep the mobile banking application password and mPIN confidential and will not disclose these to any other person or will not record them in a way that would compromise the security of the services. The customer will use the services offered under service using the mPIN in accordance with the procedure as laid down by the Bank from time to time. If the mobile phone or SIM is lost, the customer must immediately submit a written request to his branch for de-registering his Vardhaman Bank Mobile banking service. The Customer accepts that any valid transaction originating from the Customer ID and/or registered mobile phone number shall be assumed to have been initiated by the Customer and any transaction authorized by the mPIN is duly and legally authorized by the Customer. The customer shall be liable for all loss on breach of the terms and conditions contained herein or contributed or caused the loss by negligent actions or a failure to advise the Bank immediately about any unauthorized access in the Account. The customer shall keep himself/herself updated with regard to any information/modification relating to the services offered under the service which would be publicized on the websites and at the branches and would be responsible for the same. The Customer shall be liable and responsible for all legal compliance and adherence of all commercial terms and conditions in respect of the mobile connection/SIM card/mobile phone through which the service is availed and the Bank does not accept/ acknowledge any responsibility in this regard. The Customer is advised to be prudent in downloading content through blue-tooth and ensure that proper anti-virus software is used from time to time to remove malware residing in the hand-set. The Bank shall not accept any Stop Payment instructions, once the transaction amount and the beneficiary account are keyed in and authorized by the Customer. There is any kind of loss, direct or indirect, incurred by the Customer or any other person due to any failure or lapse in the service which are beyond the control of the Bank. There is any lapse or failure on the part of the service providers or any third party affecting the said service and that the Bank makes no warranty as to the quality of the service provided by any such service provider. The Bank, its employees shall not be liable for and in respect of any loss or damage whether direct, indirect or consequential, including but not limited to loss of revenue, profit, business, contracts, anticipated savings or goodwill, loss of use or value of any equipment including software, whether foreseeable or not, suffered by the Customer or any person howsoever arising from or relating to any delay, interruption, suspension, resolution or error of the Bank in receiving and processing the request and in formulating and returning responses or any failure, delay, interruption, suspension, restriction, or error in transmission of any information or message to and from the telecommunication equipment of the Customer and the network of any service provider and the Bank's system or any breakdown, interruption, suspension or failure of the telecommunication equipment of the Customer, the Bank's system or the network of any service provider and/or any third party who provides such services as is necessary to provide the service. The Bank will not be responsible if Bank’s mobile banking application is not compatible with/ does not work on the mobile handset of the Customer. In consideration of the Bank providing the service, the Customer agrees to indemnify and hold the Bank harmless against all actions, claims, demands proceedings, loss, damages, costs, charges and expenses which the Bank may at any time incur, sustain, suffer or be put to as a consequence of or arising out of or in connection with any services provided to the Customer pursuant hereto. The Customer shall indemnify the Bank for unauthorized access by any third party to any information/instructions/triggers given by the Customer or breach of confidentiality.